Florida Gov. Rick Scott speaks at a campaign event Monday in Clearwater, Florida. Scott has touted his job-creation record. The Wall Street Journal had an article last week on how many governors running for re-election are touting their economic records, and on how many voters aren’t buying their claims of progress. The Journal attributed voters’ skepticism largely to stagnant incomes, which makes sense. As I’ve said before, it hasn’t felt like much of a recovery for many Americans. Still, stagnant incomes are a national problem — it’s hard to blame it on specific governors. The same goes for lots of other indicators, good and bad. Incumbent governors such as Florida’s Rick Scott and Colorado’s John Hickenlooper are touting big declines in their states’ unemployment rates, but unemployment is way down nationally, too. Similarly, it’s hard to blame Nevada Gov. Brian Sandoval for the slow rebound in his state’s housing market given that the national housing recovery has also been lackluster. Actually, the question is slightly more complicated than that. 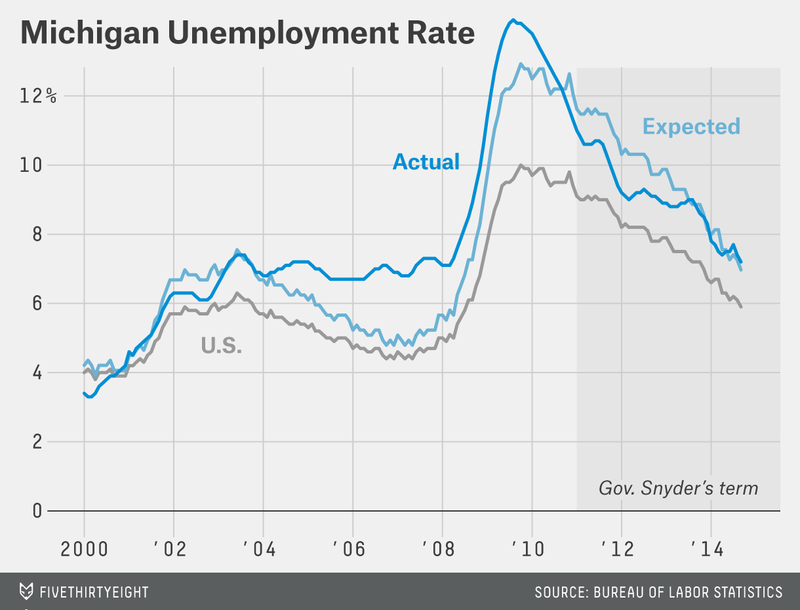 Michigan, for example, has an unemployment rate of 7.2 percent, significantly above the national mark. 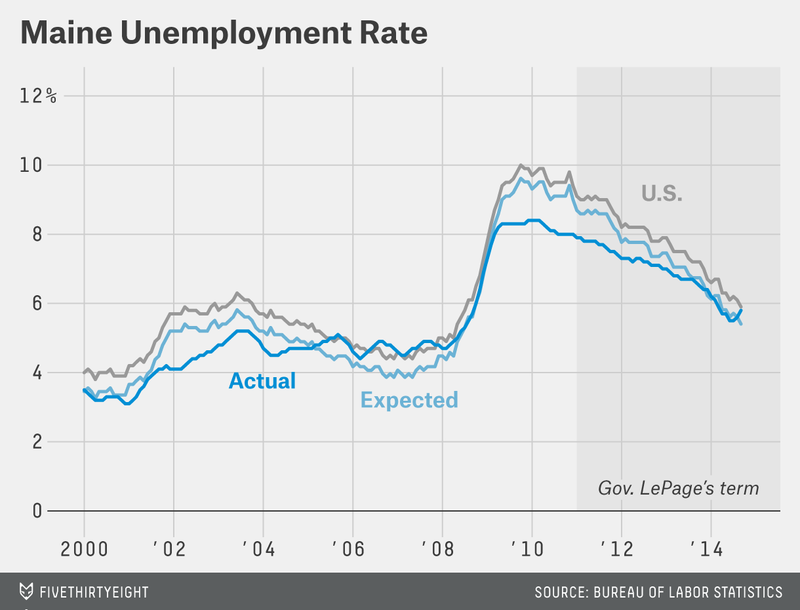 But the state has experienced higher-than-average unemployment for most of the past decade. Any evaluation of Gov. Rick Snyder’s record has to account for that trend. We can do this in a back-of-the-envelope way by modeling how a state’s unemployment rate has responded to the national rate in the past. That lets us see how a state “should” have done, just based on the national economy, and compare that to the state’s actual unemployment rate. We can do the same for other economic indicators as well. It’s important to note that this is not a formal economic model. It doesn’t take into account how the different elements of a state’s economy interact — how a weak rebound in housing could hurt the retail economy, too, for example. It doesn’t factor in states’ reliance on specific industries, such as car manufacturing in Michigan or tourism in Florida. And it doesn’t make any effort to account for how the relationship between the state and national economies could have changed over time. Those changes can be significant: Texas, for example, used to be highly dependent on its oil industry, which meant that high oil prices used to help the Texas economy but hurt the country’s. As Texas’s economy has diversified, that’s become somewhat less true. Moreover, this kind of analysis doesn’t tell us how much credit (or blame) a given governor should get for his or her state’s economic record. In most cases, the answer is probably “not much.” Many of the most important drivers of a state’s economy — its mix of industries, its cost of living, the education and demographics of its workforce — aren’t things government can control in the short term. Even the things that state governments can decide, such as tax and labor policy, usually aren’t the sole purview of the governor. In many states, the governorship isn’t even a terribly powerful office. Still, if we’re going to judge governors on their economic performance, we might as well know whether that performance has been good or bad relative to expectations. Below is a quick look at the nine states where FiveThirtyEight’s gubernatorial model shows the incumbent having less than an 85 percent chance of re-election. A quick methodological note: This is, intentionally, the simplest of models: a linear regression with the state unemployment rate as the response variable and the national unemployment rate as the explanatory variable. In all cases, the model is calibrated based on 20 years of data ending four years before the current governor took office (so, in the case of Connecticut, for the years 1987 through 2006). This allows us to see how the state’s economy has done relative to expectations both during and in the years immediately preceding the incumbent’s term. As is clear from the charts, the model fits better in some cases than in others. I’ve tried to call out the cases where the fit is particularly weak, but in all cases interpret these findings with caution. Maine, like Connecticut, fared better in the recession than the U.S. as a whole. 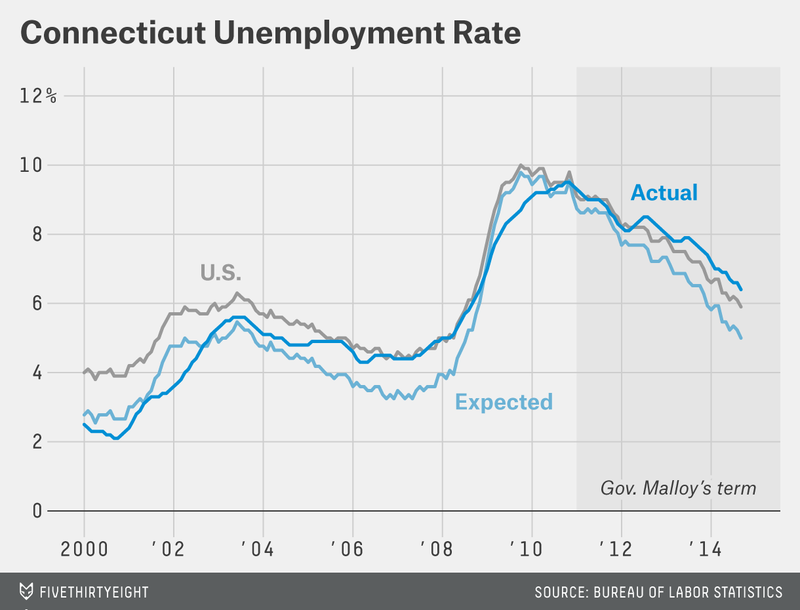 But unlike Connecticut, its recovery has been pretty much what you’d expect. Maine’s unemployment rate has ticked up a bit in the past two months, to 5.8 percent in September from 5.5 percent in July. But it’s too soon to say whether the recent rise is a statistical quirk or the start of a new trend. Prior to that, the state had been following our simple model pretty closely. Maine hasn’t done any better than expected under LePage, but it hasn’t done any worse either. 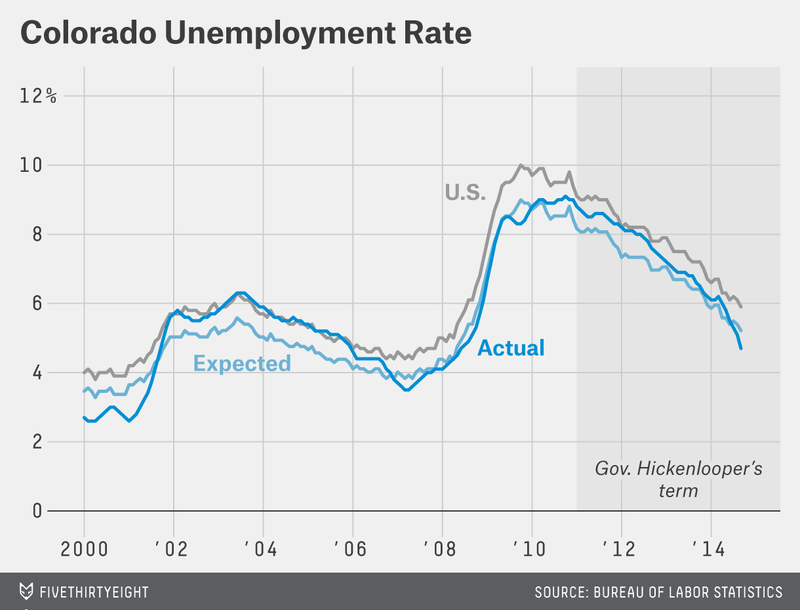 Colorado came through the recession better than many states, with an unemployment rate that barely topped 9 percent. Its recovery has been more of a mixed bag, but on the whole has been pretty much what our model would expect. The state’s unemployment rate was 4.7 percent in September, tied for 12th best in the country. But that’s only after a big drop from 5.1 percent in August, which might well have been a one-time blip. Before that, the state was pretty much where our model said it should be. One piece of good news not captured in our model: Colorado, unlike most states, has seen its average wages rise faster than the rate of inflation during the recovery. 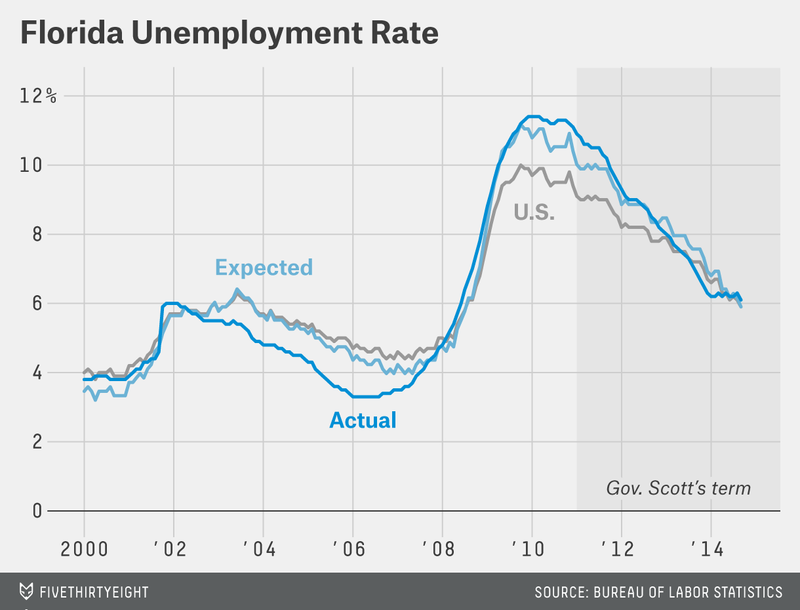 Florida’s unemployment rate usually tracks the national rate pretty closely. But the construction boom of the mid-2000s was especially strong in Florida, driving the unemployment rate below 3.5 percent in 2006, more than a point better than the national mark. Then, when the housing market collapsed, so did Florida’s economy: The state’s unemployment rate topped out at 11.4 percent in 2010, compared to a nationwide peak of 10 percent. Florida has spent the past four years getting back to normal. As of September, the state unemployment rate was 6.1 percent, not much different from the national rate of 5.9 percent. In other words, the Sunshine State is where our simple model would expect it to be, neither better nor worse. Connecticut, which may have the closest gubernatorial race in the country, didn’t suffer as badly during the recession as some states. Its unemployment rate topped out at 9.5 percent, half a point better than the national peak of 10 percent. But the state’s recovery has been relatively unimpressive. Its September unemployment rate stood at 6.4 percent, half a point worse than the national mark and more than a point worse than where the model thinks it should be. In this case, the model isn’t too bad a fit for the data. But it’s worth noting that Connecticut’s economy is heavily influenced by New York’s; a model based on New York’s unemployment rate is just as good as the one based on the national rate. New York was hit hard by the collapse of the financial sector, a shockwave that’s still reverberating across the border in Connecticut. Up until the start of the recession in 2007, Alaska’s unemployment rate had spent most of the prior two decades well above the national rate, a pattern that held during both recessions and expansions. During the recession, however, the pattern flipped: Alaska’s unemployment rate barely topped 8 percent in the recession and remained below the U.S. rate for most of the recovery. 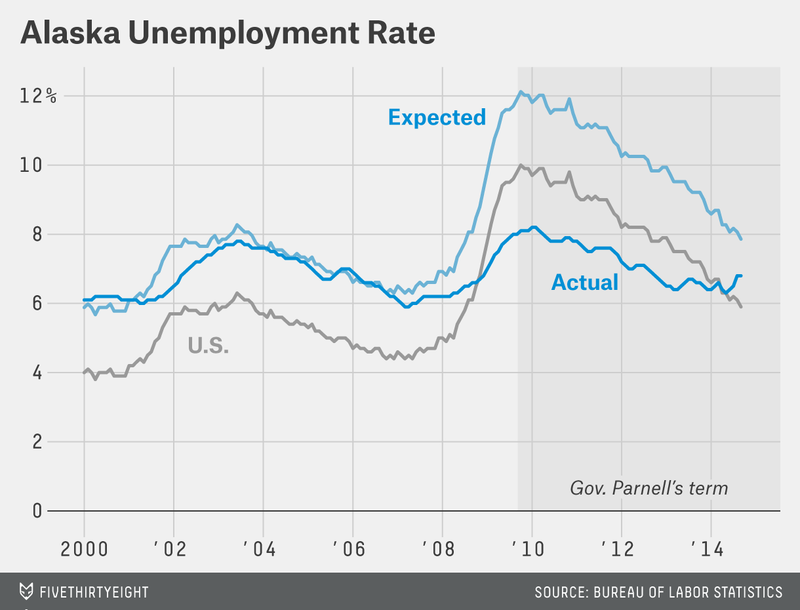 Now Alaska’s unemployment rate is rising again, even as the U.S. rate is falling. The state’s unemployment rate was 6.8 percent in September, one of the highest in the country. That’s still quite a bit better than our model predicts, but tread carefully. Alaska is less influenced by the national economy than most of the lower 48 states, and the model fit is weak as a result. 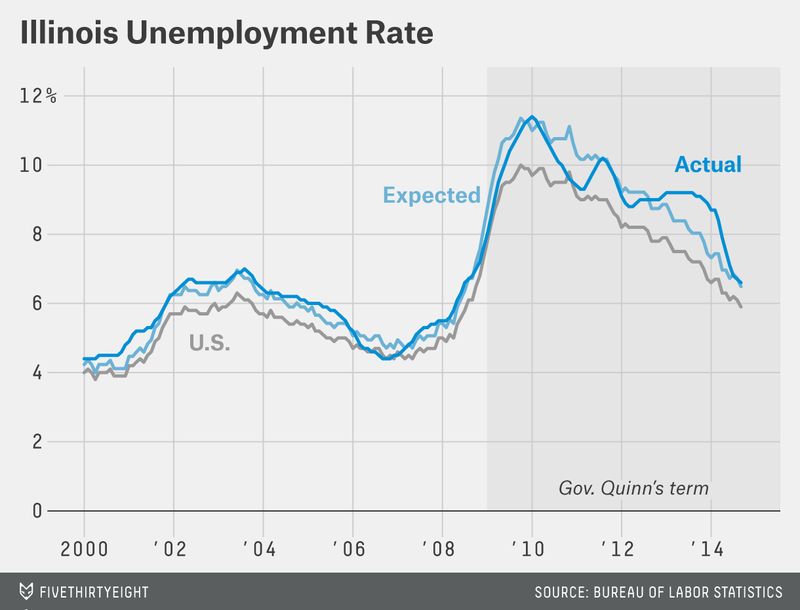 Illinois has experienced an extremely uneven recovery, with an unemployment rate that repeatedly spiked and fell. Recently, however, things have looked better: The state’s 6.6 percent unemployment rate in September was its lowest since mid-2008. What’s more, Illinois has nearly caught up with where our model says it should be. 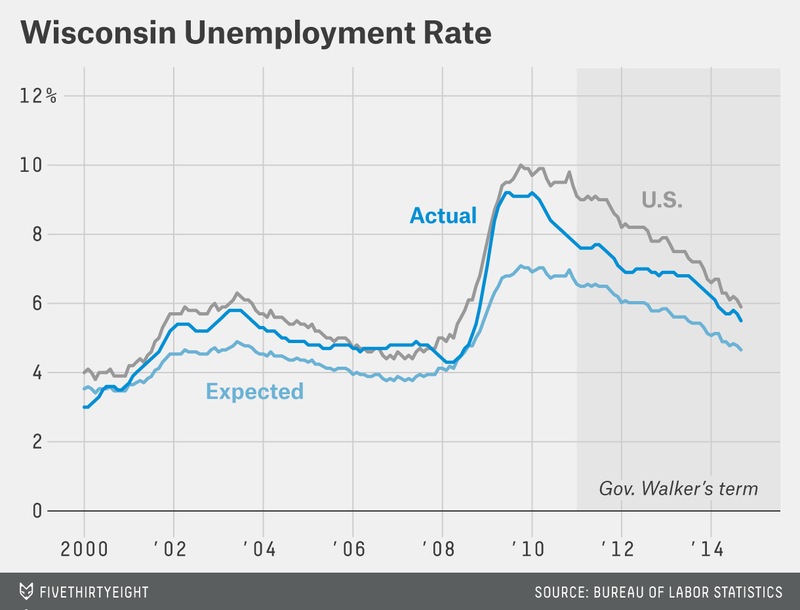 Wisconsin did much worse in the recession than our model expected. It has struggled in the recovery, too, though not quite as badly. The state’s September unemployment rate of 5.5 percent is better than the national mark but worse than the 4.6 percent that our model projects. On the plus side, its unemployment rate is falling again after stalling out in early 2013. So, while Wisconsin is doing worse than our model suggests it should, its economy is getting better in absolute terms. On the surface, Michigan’s unemployment rate of 7.2 percent isn’t too impressive given that the national rate dropped below 6 percent in September. But factor in how bad things got for Michigan during the recession — 14 percent unemployment in 2009 — and the state’s recovery looks more impressive. Ultimately, Michigan’s unemployment rate is about where our simple model suggests it should be – above the national mark, but only by about a percentage point. Interestingly, the model suggests that if there’s a period during which the state underperformed, it was in the years before the recession, when Democrat Jennifer Granholm was governor. Our model suggests the state’s unemployment rate should have fallen below 5 percent in late 2006 and early 2007; in reality, it barely dipped below 7 percent. 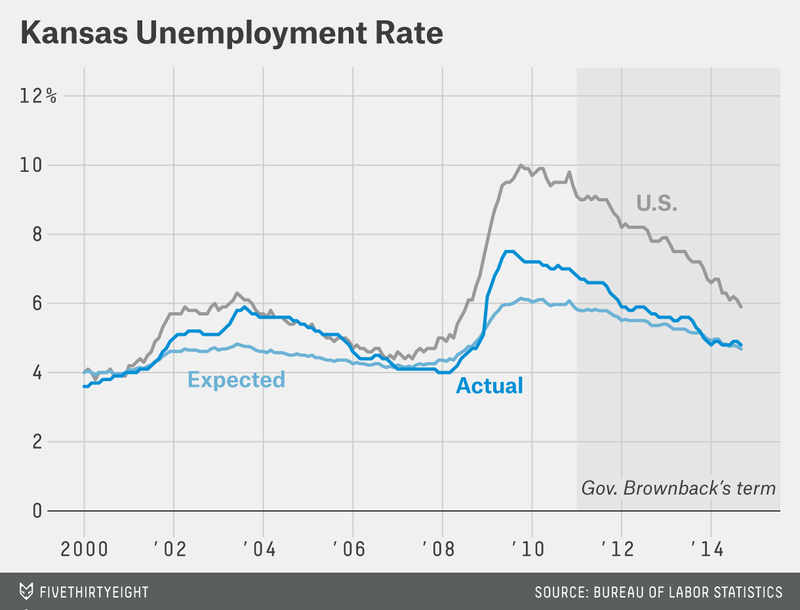 For most of the past two decades, Kansas has enjoyed an unemployment rate significantly below the nation’s. It hasn’t topped 7.5 percent since at least 1976, when records start. It has been higher than the national mark for just one month over that entire period. It isn’t much of a surprise, then, that Kansas’s September unemployment rate, at 4.8 percent, is among the lowest in the nation. In fact, that’s about where our model says it should be. But that’s a more impressive showing than it may seem to be: Kansas’s unemployment rate got well above its predicted level during the recession, though it stayed well south of the national rate and it’s only in the past year or so that it’s caught up. Still, that pattern is consistent with the way Kansas’s unemployment rate behaved following the last recession, in 2001, so it isn’t clear how much credit Brownback can take for the recent rebound. CORRECTION (Nov. 4, 11:05 a.m.): An earlier version of this article misidentified the likely winner of the Wisconsin gubernatorial race. It’s Scott Walker, not Rick Snyder.